There are millions of videos that are present on Internet and are made available at various online video sharing websites. You can find entire movies, music videos, and many other kinds of videos that you may like. So, if you only want the audio of those music videos files then you can choose to convert MP4 to WAV audio tracks. There are tons of converters available on the internet, but if you want to get a high-quality converted file in least possible time, then you will need to take the help of KeepVid Video Converter. KeepVid provides you with various types of conversions. You can convert mp4 to wav format using this converter. KeepVid Online Video Converter is an online website which enables you to convert MP4 to WAV file online without installing any other third-party software. This online video converter website has a very easy-to-use interface, so that you can convert videos with easy steps. This online video converter fully supports more than 50 video and audio formats. The online conversion requires fairly stable Internet connection, therefore the large video files are not recommended to use online video converter. 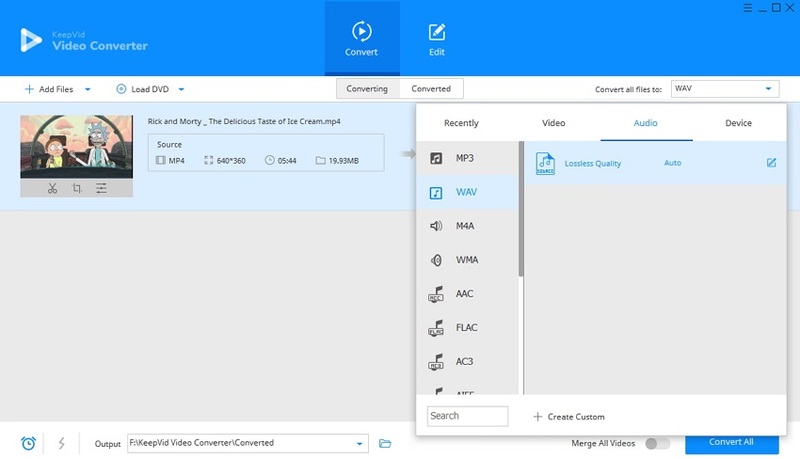 On the contrary, if you want to convert WAV to MP4, you can also take advantage of KeepVid video converter solutions. KeepVid will help you to finish the task in very short time. KeepVid also provides you desktop software to convert MP4 to WAV format.  In fact, KeepVid Video Converter can help you to convert videos to more than 1000 video and audio formats. You can manually convert MP4 to WAV file in no time on your Windows or Mac computer without the Internet connection. At times, you’ll have very large MP4 files. When converting these files, you can turn on the High-speed conversion mode so that you can convert videos with 30x faster converting speed. 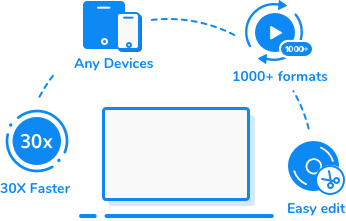 Convert Videos: Besides converting MP4 to WAV audio files, KeepVid Video Converter also enables you to convert videos to more than 1000 video and audio formats. Edit video and audio: Edit videos with trimming, cropping and effects features. Download video: This video converter also provides you a download feature which supports you to download videos from more than 10,000 video sharing sites. Fast conversion speed: This video converter provides a high-speed conversion feature that helps you to convert videos with 30x faster speed. Step 1. Start KeepVid Video Converter and add MP4 file from your computer. Step 2. Select WAV as output format and click the Convert button to start coverting MP4 to WAV file. Step 3. When the conversion finishes, turn to Converted tab and find your converted WAV file. Firstly, download and install KeepVid Video Converter on your computer, and then start it. After that, select the Convert section at the top middle of the main interface. Click the Add File or Add Folder button at the upper left corner of the homepage, and add the MP4 video from your computer to the software window. Or you can drag and drop the MP4 video into the software window directly. After adding the MP4 video into the program, you can click the inverted triangle beside the Target area and select WAV as an output format in the pop-up dialog. You’re also allowed to click the inverted triangle beside the Convert all files to button, and choose WAV as an output. After that, click the Convert Button or Convert All button to start converting MP4 to WAV file. When the conversion finishes, you can go to the Converted tab, and find your converted video. 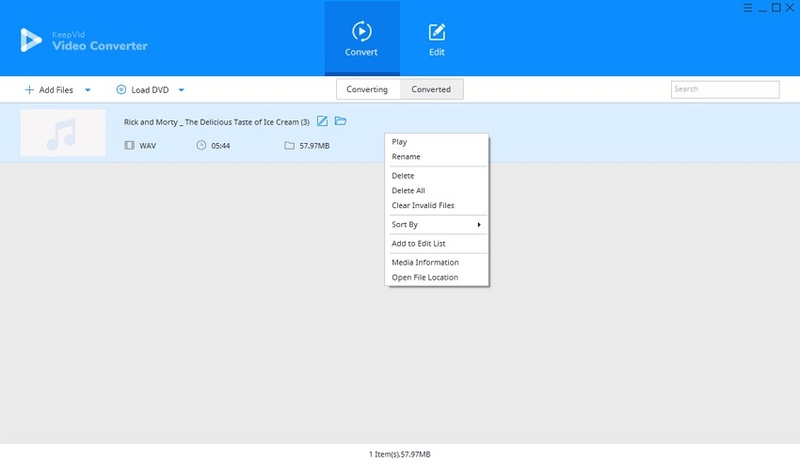 You can also right-click the video and choose Open File Location to find the video in your computer. WAV format is an audio format that was first created by Microsoft and soon became a standard for most of the Microsoft windows sound. These formats are widely used in operating systems, software, games, and many other kinds of audio format. Now days this format is also being widely used with the multimedia devices such as mobile phones, and tablets. With this format you can also manage the frequency as well as bitrate of the audio file that you need to create.